Milwaukee Police Chief Fails to Heed Warning About Rogue Cops | Hupy and Abraham, S.C.
Is there a connection with the Frank Jude case? Milwaukee is home to Harley-Davidson, and riders from around the world are welcomed here during events celebrating the motor company’s longevity and dominance in the heavyweight motorcycle market. Not everyone is welcome though. Long after the world travelers return home with tales of how warm and hospitable the city is, local riders sometimes feel a colder reception, especially club members. That’s exactly what happened to several members of the Outlaws Milwaukee MC. One member in particular was targeted for exceptional harassment to the point of being dismissed from his job because of pressure put on his employer by an investigator in the District Attorney’s office. That prompted a call to Attorney Michael Hupy, who in turn wrote letters to the mayor and police chief on December 11, 2003, complaining about the conduct of several police officers and the investigator. Those complaints were met with an attitude of complacency. Misconduct on the part of the officers continued, including threats of physical harm, with more complaints voiced to the police and district attorneys office. It wasn’t until the rogue investigator assaulted a Deputy Sheriff that action was taken. You can read more about this on the Hupy web site at hupy.com, click on rider news, and scroll down to the related story. Just over a year after Mike Hupy’s letters of concern, the police are embroiled in another controversy. Frank Jude Jr. was severely beaten by a group of off duty Milwaukee police officers. Had the chief and mayor heeded Mr. Hupy’s letters, could this travesty been avoided? We’ll never know if a policy change or disciplinary actions might have prevented this latest mark on the city. What we do know is that Attorney Hupy recognized a deep-rooted problem that needed immediate attention and he notified the proper authorities. 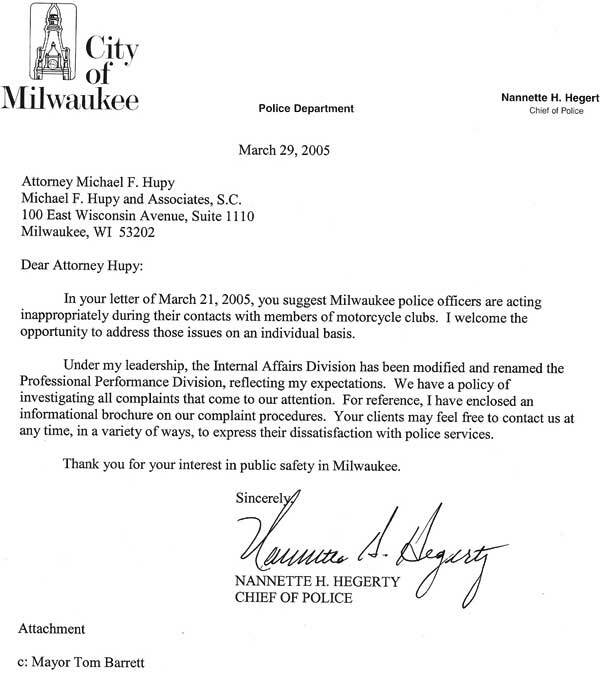 Editor’s Note: Milwaukee Police Chief Responds: Milwaukee Police Chief, Nannette Hegerty, has noted the concerns of riders. On March 21, 2005, I wrote her a letter telling her that after she apparently did nothing to stop illegal activities on the part of member of the Milwaukee Police Department in response to my letter of December 11, 2003, members of the department continue to engage in inappropriate conduct. She responded on March 29, 2005, and her letter follows.